After enjoy five months in the spotlight of Sprint exclusivity, Palm’s flagship Treo 755p has finally made its way to another domestic CDMA carrier. Alltel has quietly released the Treo 755p on their network. The Alltel version of the 755p has a full retail price of $579.99. Signing a two-year contract brings a $180 instant discount and $100 mail-in rebate with 2-year contract, effectively reducing the price to $299.95. Apparently only the standard blue color 755p is available on Alltel, with the much rarer burgundy version a Sprint exclusive. No word on any carrier-specific customizations or ROM software bundles, but it would appear to be a safe assumption that the Alltel version is not as "loaded" as the Sprint version of the phone. This might be seen as a distinct advantage or disadvantage by different sorts of users. With the recent launch of the 755p on Canada’s TELUS CDMA network and now the Alltel availability, the recent rumors of the long-delayed Verizon Wireless release of the 755p seems all but certain. In fact, several TreoCentral forum members have reported that the newest Verizon mail-in rebate forms indicate a $50 MIR for the 755p and a huge $150 MIR for the 700p. While the 755p is undoubtedly sleeker and more stylish than its 700p predecessor, the 700p is finally enjoying solid stability after its re-released 1.10 ROM fix. 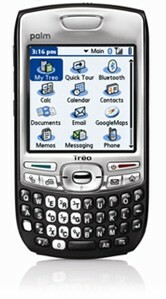 In addition, the 700p’s marginally larger, fully-backlit keys, reset button, fullsize SDHC slot, and higher-capacity battery options may still make it the Treo of choice for power users, especially with a $150 rebate factored into the equation. The Alltel 755p is available for purchase now on Alltel’s web store. Palm has also updated their 755p product page to reflect the Alltel availability. I am so excited to try it out. Is my seidio battery I have for my 700p going to work? I have the 3200 mAh.